Since a gunman opened fire on thousands of people attending an open air country music conference in Las Vegas two weeks ago, authorities appear no closer to determining a motive. On October 1, 64-year-old Stephen Paddock, began firing upon concert goers from his 32nd floor corner suite at MGM’s Mandalay Bay Hotel, killing 58 and injuring hundreds more. A stash of forty-seven high power guns were later found in Paddock’s hotel suite and two homes, police said. A series of missteps in breaking down the timeline coupled with the lack of motive has led conspiracy theoriest to determine there is a THERE there. 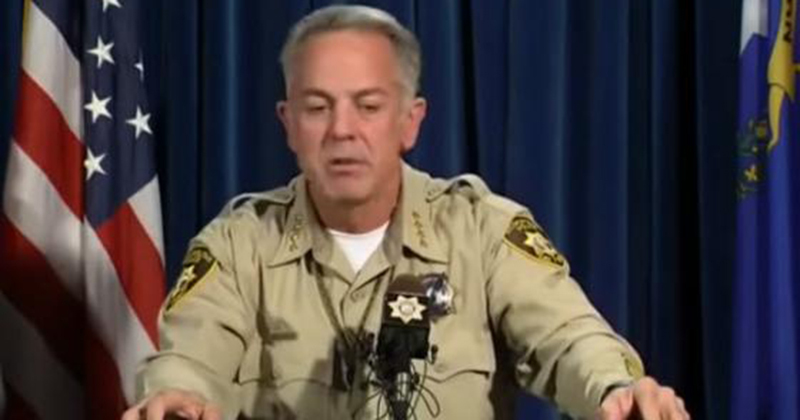 Clark County Sheriff Joe Lombardo broke down in tears Friday while praising his officers efforts. Don’t tell that to the likes of Wayne Allyn Root, a long time occasional special contributor to the Gambling911.com website, Las Vegas Review Journal columnist and right wing radio host. Root regularly features Gambling911 reporter Thomas Somach on his program and would sometimes open rallies for then US Republican Presidential candidate Donald Trump. Within hours of the mass shooting, Root was already suggesting ISIS ties. Anyone who still trusts FBI is ignorant or naive. FBI so politicized openly cover up crimes for Democrats. Root is far from alone when it comes to pointing out possible conspiracy theories tied to the Vegas mass shooting. ISIS, Antifa and even the Illuminati have all been brought into the conversation. The Mandalay Bay refused to call the police until Paddock began firing into the crowd. Paddock was framed by someone else who committed the crime and left before police arrived. Paddock had access to a service elevator, and that helped him carry out the shooting. The shooting was an inside job, and someone working at the Mandalay Bay knew about it. There was a second shooter who confused police. The idea of a conspiracy gained further momentum after it was revealed Thursday evening that the security guard who first responded to the shooting and was shot himself skipped out on a series of interviews, including with Fox News Sean Hannity. As of Saturday morning, Jesus Campos, whereabouts were not immediately known. The Los Angeles Times published an article this week questioning how a “miniature surveillance state” like the Mandalay Bay could miss Paddock’s stockpiling of so many weapons, not to mention his alleged sealing up of stairway doors. Paddock himself was a high stakes gambler who won hundreds of thousands of dollars at various Vegas casinos. He’d be just the type of individual under surveillance the very second he stepped foot on the casino floor. Mother Jones writer Bryan Schatz Friday tackled the various conspiracy theories in a piece entitled “Trump Supporters Are Promoting Insane Conspiracy Theories About the Vegas Shooter”. Of course, whenever there’s a mass shooting or a terrorist incident, there are always conspiracy theories—queue the never-ending babble of JFK or 9/11 truthers. But what’s different this time is that, in our current fact-averse political moment, even those with links to the White House are promoting them and inflaming their enormous fanbases with politicized propaganda. The spread of rightwing blogs, claiming the shooter was an anti-Trump liberal, on to mainstream platforms is the latest example of hyper-partisan trolling after a tragedy, the London Guardian wrote within days of the massacre. That media outlet made it a point to question whether left-wing, anti-Trump folks are immune to such conspiracy theories. They are not, the Guardian notes. Conspiracists on the left have tended to focus upon a single salient fact: Stephen Paddock was a white man. As for Root, he hasn’t taken kindly to Mother Jones calling him out. I'm giving liberal media "ROOT DERANGEMENT SYNDROME." Easy to do. They're already mentally ill, weak, snowflakes. The investigation continues and the conspiracies aren't going away any time soon.